This electrical outlet caps plug provides not only child safety but also insulates your home. It eliminates air drafts coming from the electrical outlets by covering them. They are designed optimally with children in mind. 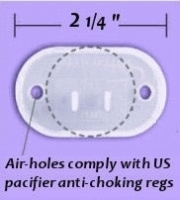 Regular outlet plugs are on 1.4 inches wide which can be a choking hazard for small children. The size of this electrical cap plug is 2.25 inches wide which is too big to fit inside a child's throat.